We’re in Esfahan now (unquestionably one of the most stunning cities I’ve ever visited) but I want to tell you first about our day yesterday, which we spent at Mofid University in the city of Qom. Qom is considered a holy city for Shia Islam and is the largest center for Shia scholarship in the world. In addition to traditional Islam, most of the seminaries also offer courses in social sciences, Western thought and comparative religion. 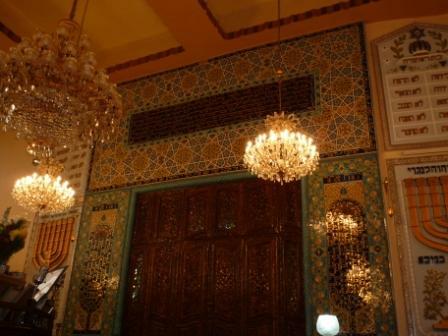 Mofid is considered one of the more liberal universities in Qom and is notable in particular for its interfaith research. We spent the better part of the day at Mofid, visiting and dialoguing with professors and students. Any preconceptions we may have had about an Islamic university in Iran went out of the window almost immediately. We introduced ourselves to our host and the professors introduced themselves to us – they included scholars who were versed in a remarkable variety of subjects including Jewish law, contemporary feminism and Western philosophy. 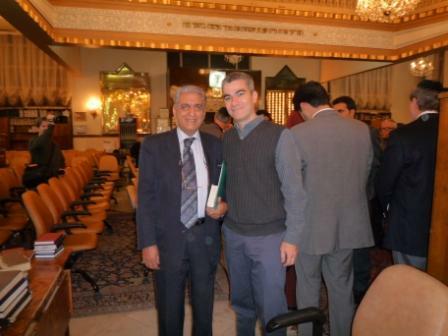 That’s me above with Dr. Masoud Adib, who among other things has translated a book by Dr. Jacob Neusner (a prominent American Jewish scholar) into Farsi. In the pic below Rabbi Lynn (left) poses with Fatima (center) a graduate student who is currently studying Rashi’s commentary on the Torah and has translated the Book of Mormon into Farsi. On the right is Haydeh Rostam Abadi, who works with the Center for Interreligious Dialogue and has been traveling with us for the past few days. Her research, among other things, focuses on a comparison of the Catholic and Islamic concepts of revelation. Our discussion took the better part of two hours. The professors discussed their study of the relationsip between Islam and the other religious traditions and their research in the fields of comparative religious philosophy and law. The theological validity and spiritual worth of all Abrahamic religions was a common and recurring theme . Members of our group also spoke about Jewish and Christian attitudes toward Islam. Our discussion was relatively brief in the scheme of things, but it was enough to give us all the sense that these Islamic scholars were deeply engaged in a wide spectrum of religious and philosophical ideas and that they had an abiding desire to meet and learn from others. After our meeting we shared lunch with teachers and students and continued our conversation in a more informal manner. This was followed by a longer conversation with the thoughtful and enthusiastic students of Mofid. In the pic below, one of our younger delegation members, Ariel Vegosen (right) is chatting up a group of young students. This entry was posted in Interfaith, Iran, Iran Trip 2008, Islam, Judaism, Nonviolence, Peace, Religion on December 2, 2008 by Rabbi Brant Rosen. Our last day in Tehran was a rainy one, beginning with a visit to the headquarters of the Tehran Jewish Committee (roughly the equivalent of the Iranian Jewish Federation). We spoke at length with Committee President Rahmat ollah Raffi, who gave us a thorough tutorial on the Iranian Jewish community. 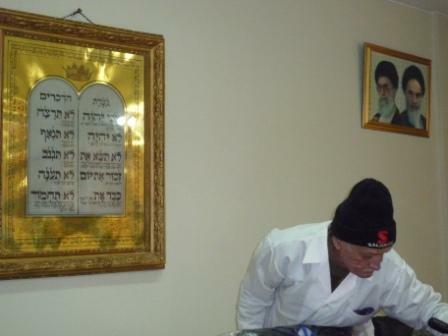 In short: there are roughly 20 – 22,000 Jews in Iran. The majority live in Tehran, followed by Shiraz and Esfahan. Jews have had a long and noble presence in Persia – they have lived there for almost 3000 years, making them the oldest Diaspora Jewish community in the world. Before 1979, there were over 100,000 Jews in Iran. As many were royalist supporters of the Shah, tens of thousands of Jews emigrated following the Islamic revolution. Most now live in the United States – there are approximately 40,000 Iranian Jews living in Los Angeles alone. The Jews who chose to remain in Iran, however, are fiercely proud of their Persian Jewish heritage and those with whom we spoke told us they feel very comfortable living as Jews in an Islamic nation. Judaism, along with Christianity and Zoastrianism, are officially recognized religions, which allows them to get significant subsidies from the government as well as Parliamentary representation. (It was pointed out to us that while the Iranian Constitution stipulates one member for every community of 500,000, the Jewish community has been granted a representative even though they only number 20,000). The Tehran Jewish Committee (and other Jewish centers in smaller Jewish communities) supports a variety of community institutions, including synagogues, religious schools, kosher butchers and restaurants, and Jewish cemeteries. They also support major Jewish medical center in Tehran about which they spoke with particular pride. The Dr. Sapir Hospital was founded 60 years ago and was originally the only hospital serving the Jewish community in Iran. It now has 120 beds and only 5% or so of their patients are Jewish. Most of the physicians, however, are Jewish and many of them have received awards from the government. Remarkably, Sapir Hospital receives no money from outside Iran. (Pic below: Alan Gratch and FOR Executive Director Mark Johnson at the entrance to the Center office). The Center is also extremely active in Jewish cultural projects: they publish a Jewish magazine called “Bima,” and have begun publishing cultural/religious books in Farsi. All told, the activities of the Iranian Jewish Committee point to a strong Jewish community. One leader told us that they considered themselves to be Iranian Jews rather than Jewish Iranians – their strong connection to Persian heritage is in many ways the primary and driving aspect of their Jewish identities. The Jewish leaders with whom we met stressed repeatedly that they have good relations with the Islamic government and said that they strive to remain apolitical in all their dealings. In certain ways, however, it seemed to me that for them, “apolitical” meant toeing the Iranian political party line. Their attitude toward Israel is the most primary example – whenever they spoke of Israel, it was invariably in a disparaging manner characteristic of official Iranian government pronouncements. Although they insist they live well as Jews in Iran, it seemed clear to me that they’re extremely careful not to make waves. Even with all the complexities involved, I can’t help but feel that we American Jews are missing out on a huge opportunity by failing to learn about and forge greater ties with Iranian Jewry. This is truly an exciting and vibrant community and we clearly have a lot to learn from each other. I’m excited with the prospect of building upon the relationships that we’re creating here. 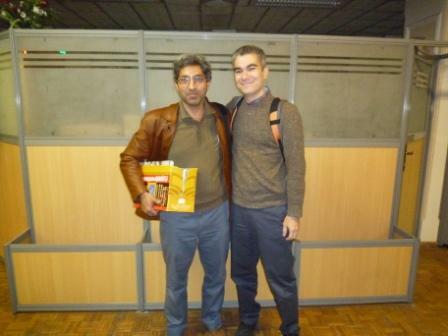 We met Habib in his Tehran office, where he screened the film for us. It’s a powerful war drama about a teenage Iranian soldier who is given the job of escorting 38 Iraqi POWs on a bus to prison camp. In our conversation afterwards, we learned that the majority of the events in the movie were based on his own war experiences. We in the West know very little about this eight year war, but it for Iranians it continues to be a traumatic and transformative event. Almost an entire generation of young Iraqis were decimated by the Iran-Iraq war, in which hundreds of thousands of young, ill-equipped Iranian men were sent in human wave attacks to almost certain death. Many, including Habib, are living with the terrible after affects of chemical weapons poisoning. In addition to his creative work, Habib is a committed anti-war activist. His production company recently took “Night Bus” to the western border towns to screen for young people in the small western communities where the war was fought. He hopes to show the film to greater numbers of Iraqis as well, to help raise consciousness about war and its tragic after affects. Habib has also worked considerably to raise awareness about the downing of an Iranian passenger plane by an American warship, the USS Vincennes, in 1988. 290 Iranian civilians died in this tragedy, which the US government originally covered up and for which it has never apologized. (Adding insult to tragedy, some officers of the Vincennes were actually awarded medals in the wake of the disaster). Again, most Americans barely remember this event, if they remember it at all. But as Habib and others have told us, Flight 655 is Iran’s 9/11 – and it remains as yet one more painful obstacle to Iranian-American reconciliation. Habib has gained some fame for a public letter he wrote to the Captain of the Vincennes, Will Rogers III, who remains implacably unrepentant to this day. It’s a remarkable document, filled with pain, but also a powerful palpable desire for reconciliation. In its way, I think, it seems to speak for many in this country. Tommorow we’re off to Qom to dialogue with Muslim scholars at Mofid University. This entry was posted in Interfaith, Iran, Iran Trip 2008, Nonviolence, Peace, Religion, War on December 1, 2008 by Rabbi Brant Rosen. Our first full day in Iran was devoted largely to religious destinations – our first stop was a visit to the office of Ayatollah Bojnoordi, a prominent religious leader who teaches Islamic law at Tehran and Qom Universities. Ayatollahs are clerics of the highest order in Shia Islamic communities and they exercise enormous authority over their respective flocks. They are educated in seminaries, the most prominent of which are located in Najaf, Iraq and Qom, Iran (we will be traveling to Qom on Monday). Ayatollahs are awarded their titles after attending many years of rigorous training, which include such subjects on theology, jurisprudence, literature, as well as grounding in Western as well as Islamic philosophy. The status of an Ayatollah depends largely upon his scholarship and publication as well as the breadth of his patronage over his congregation. In Iran, of course, Ayatollahs can be political as well as religious leaders. Though the country is governed by a parliamentary democracy, no political decisions can be made without the ultimate approval of Iran’s Supreme Council of Ayatollahs and the Iran’s Supreme Leader, the Ayatollah Khameini. Like all of our Iranian hosts, Ayatollah Bojnoordi received us with the requisite Persian hospitality. (At every meeting we attend, we are invariably served with a generous spread of cakes, fruit, coffee, tea, juice etc.) He spoke to us for the better part of an hour, with Leila serving as interpreter. His message was largely one of religious tolerance and reconciliation: he said emphatically that he believes Islam teaches all Abrahamic religions ultimately have the same aim: to promote peace and coexistence. Quoting the Koran, he said that peace is the ultimate goodness and war is the ultimate evil. (Interestingly, he also cited Hobbes’ assertion that war represents the animal aspect of humanity). He condemned all who used violence to achieve their aims – adding that all Muslims who act violently act counter to the way of Islam. The Ayatollah also did not flinch from addressing politics head on. He underlined Imam Khomeini’s statement that Iran is a peaceful nation that doesn’t want war with anyone. He mentioned that in the past two hundred years, Iran has never invaded another country. The eight year war with Iraq, he said, was a defensive war against a country that aggressively sought to seize Iranian territory. He made a point of saying that Iran is surrounded directly by fourteen countries and it must constantly be on its guard, especially against the US, who has a significant military presence in the region and has made periodic threats to invade their country. He made no bones about his loathing of George Bush in this regard and he expressed his hope that our new President will pursue a path of peace. After we spoke, our group peppered him with questions, most of which he answered with what I believed was genuine thoughtfulness. While I agreed with much of what he said, I was eager to engage him more on the political front – and since he was so candid in opening the door on political issues, I decided to press him a bit. He had mentioned earlier that he thought Hezbollah was a force for good and unity in Lebanon. I asked him, given his condemnation of the use of violence, what he thought about Hezbollah’s claim of responsibility for numerous suicide bombing attacks. To my surprise, he thanked me for my question. He responded that he believed these bombings were wrong and that he condemned them. But he added that since Hassan Nasrallah has assumed leadership of Hezbollah he believed the organization was making important strides in changing their approach and that he hoped/expected them to convert from a primarily military force to a political party. In the end, I realized that as much as our trip is focused on interfaith dialogue, you can never completely divorce religion from politics, especially in a nation such as Iran (which is, after all, governed by clerics). As regards this particular conversation, I can only say that while I didn’t always agree with his political assertions, I never once felt that he was speaking to us in a disingenuous or cynical way. I saw something authentic about the way in which he received us and I did indeed believe him when he told us finally, that everything he said to us came from the bottom of his own heart. For our part, we must constantly bear in mind that we have not come here to debate or coerce. The goal of our delegation is to learn, to share, and to create connections within what is currently a terribly poisoned atmosphere between our two countries. And at the end of the day, I genuinely believe that meetings such as this, in a small but critical way, contribute to that goal. 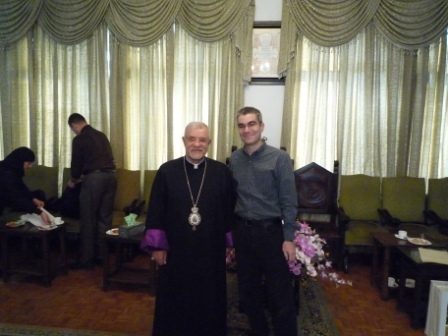 Our next stop was a visit with the Armenian Archbishop Sebouh Sarkissian at the Armenian Apostolic and Orthodox Church. Christianity, like Judaism, is an officially recognized religion in Iran and the Archbishop stressed to us that there have been Armenians in Persia even before the era of Jesus. Among other things, he stressed to us that the Islamic Republic is a religiously tolerant nation, and whatever difficulties there might be to live as a Christian in a Muslim nation, they were far outweighed by the benefits. (I am eager to explore the role of religious minorities in Iran further when we visit Jewish communal leaders on Sunday. Our final visit of the day was with our hosts at the Center for Interreligious Dialogue. The Center is technically affiliated with the Iranian government (through the Department of Education and Research) but it operates in a sphere that ranges far beyond the government, conducting academic research and dialogue with a wide spectrum of faiths. The Center’s Director, Dr. Rasoul Rasoulipour, is a Professor of Philosophy and is clearly committed to religion as a force for uniting peoples. He also been the guiding presence for these eight FOR delegations from the Iranian side and his commitment to the power of dialogue and relationship is immediately obvious. We were all immediately taken by his warmth and humor, even as exhausted as we were by our first full day in Iran. 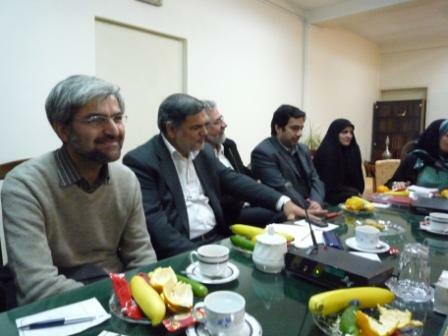 This entry was posted in Interfaith, Iran, Iran Trip 2008, Islam, Peace, Religion on November 30, 2008 by Rabbi Brant Rosen. Greetings from Iran! We arrived on Friday with no problems and have now settled comfortably into our home at the Howeyzeh Hotel in Northern Tehran. Since we actually arrived at 2:30 am, our first day here was really a half day. When we arrived at our hotel, we went promptly to sleep and woke up in time for lunch. We were delighted to see our friend Leila Zand, the FOR staff person in charge of organizing our trip. We were even more delighted to learn that she will be joining us for the duration of our delegation. Leila is an Iranian woman who has lived in NY for the past several years and in the short time we have gotten to know her, she has already become a dear friend to us. After lunch many of us took the opportunity to informally walk in groups about the area near our hotel. It is no problem for us at all to walk about freely and it felt perfectly natural to do so. The neighborhood here is a downtown area, full of shops, offices and apartment buildings. 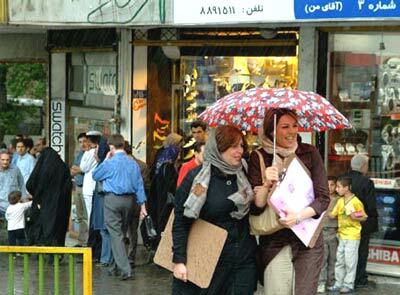 Tehran is very much the big city, big, noisy, bustling and filled with constantly-busy trafffic. Even so, there was not a moment in which we felt unsafe and although we were clearly western tourists, many people smiled and nodded at us as we went by. Many in our group reported that they struck up conversations with folks – one group met some people who turned out to be Jewish and were excited to meet a group with American Jews. They invited us to their shul (which is apparently within walking distance to the hotel) for Shabbat services tomorrow morning. Later in the afternoon we went to Shabbat services at the Abad Yosef synagogue, also in Tehran. Although it is a relatively new shul by Iranian standards, it definitely has a venerable quality about it. The sanctuary is breathtaking, the ark decorated by exquisite tiling and mosaic in the Persian/Middle Eastern style (see pic above). We were the first to arrive and when we settled in for services there were maybe only 20 elderly worshippers with us. That soon changed. Like shuls everywhere, folks gradually trickled in and before we knew it, we were surrounded by over 200 people. The vitality and vibrancy of the community was truly something to behold – older men davening, people chatting animatedly, young children running and playing throughout the sanctuary. The service was led by a variety of members at different points, including young teenagers. The style of the service was what is typically referred to as Mizrahi (Eastern), sung in distinctive Middle Eastern nusach (melody). As in most traditional shuls, there was something of a happy chaos to the proceedings. For some members of our group it was their first experience in a Jewish service. While it was virtually impossible to follow along at times, the atmosphere in the sanctuary was warm and infectious. 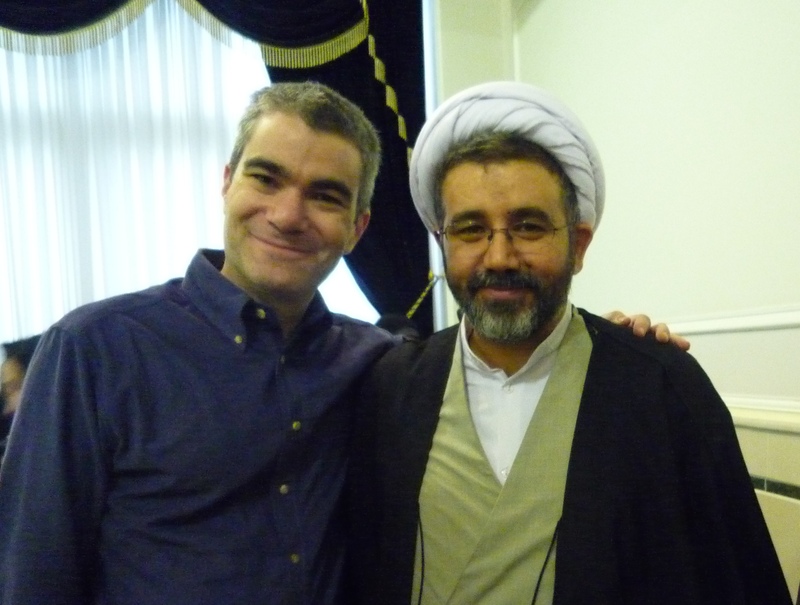 After the rabbi gave a sermon on the weekly portion, our group was introduced to the congregation by Dr. Rahmat ollah Raffi, the President of the Tehran Jewish Committee (with me, below). Rabbi Lynn Gottlieb, one of the leaders of our group addressed the congregation and thanked them for receiving us. Rabbi Lynn attended the FOR Iran delegation last spring, and she was clearly familiar now to many in the room. When she asked our delegation to stand, the crowd burst out in loud applause. Then she introduced another member of our group, Sarah Bassin, and told them she was a studying to become a rabbi, the applause got even louder. 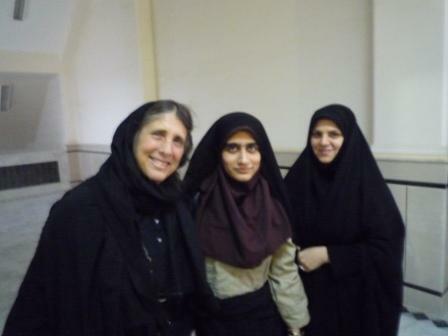 When Lynn first visited, it was the first time a female rabbi had visited Iran. Obviously this is a concept with great appeal in this country. (Lynn told me later that after the service, a man came up to her and said he hopes his daughter will be able to become a rabbi some day). Lynn then introduced me to the congregation and I got up and delivered a short Dvar Torah on the weekly Torah portion, which begins with the birth of Jacob and Esau. I mentioned to the congregation that since these twins are struggling in the womb, we might deduce from the text that war is simply preordained, inevitable. But of course we will soon learn that is in not that simple. Jacob will struggle mightily over the next two portions, and this struggle will transform him in powerful ways. So much so, in fact, that when he eventually meets up with his brother again, they will put their arms around one another once again – but this time they will embrace in forgiveness and reconciliation. Jacob remarks that to see his brother’s face is like seeing the face of God. I concluded that our delegation was in Iran to prove this very point: that while too many believe that conflict is inevitable between our peoples, we are here so that we may truly look into the faces of our Iranian brothers and sisters – and in so doing to discover the face of God. After the service we were received with great delight and enthusiasm, staying for introductions and conversations for the better part of an hour. What an incredible first experience for us. Most Westerners don’t even know that there are Jews in Iran, let alone a community this rich and vibrant. More importantly, though, it truly reminded us of why we have come: to reach out, to make friends, to build relationships, to find our common humanity. It certainly hasn’t taken us very long. Not even 24 hours in Iran and it already feels like we are home. 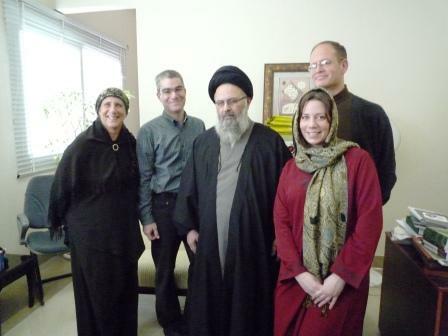 This entry was posted in Interfaith, Iran, Iran Trip 2008, Peace, Religion on November 29, 2008 by Rabbi Brant Rosen. I’m writing this one from Amsterdam, where we are waiting for our connecting flight to Imam Khomeni Airport in Tehran. Our delegation has spent the last day and a half in Nyack NY at the Fellowship of Reconciliation offices, participating in sessions that reviewed Iranian history and politics, civilian diplomacy and interfaith dialogue. It’s a wonderful group and we are enjoying getting to know one another. That’s us in the pic above, taken outside the beautiful FOR house office on the mighty Hudson river. As you can see, the women in our delegation used the group photo as an opportunity to practice tying on their hijabs. As far as group demographics go: there are fourteen of us: ten Jews and four Christians. (It’s by far the most Jews that FOR has ever sent on an Iran delegation). It’s a wonderfully diverse group generationally, ranging from ages 24 to 79. Our only major disappointment is that six original members of our delegation are not able to attend due to visa problems – including the two Muslim participants. We are holding out hope that two of the six might still be able to join us later, but prospects are looking increasingly grim on that front, alas. At any rate, we are on our way and it’s safe to say that we are uniquely thankful this Thanksgiving day for having the opportunity to participate in this incredible trip. As I wrote earlier, I will do my best to blog whenever possible along the way. Please keep checking in. 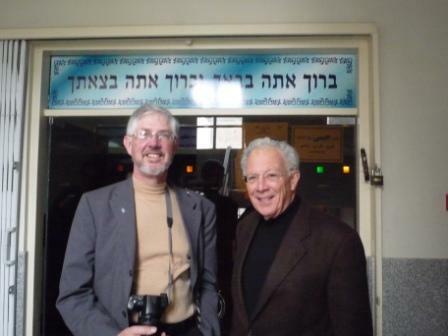 This entry was posted in Interfaith, Iran, Iran Trip 2008, Peace, Religion on November 27, 2008 by Rabbi Brant Rosen. As I mentioned in an earlier post, I’m off to Iran tomorrow on a two-week interfaith delegation sponsored by the Fellowship of Reconciliation. If you’ve been reading my blog even semi-regularly over the years (check out the “Iran” category) I’m sure you know I’ve long felt that as Americans and Jews our opinions of Iran are too often based on fear and ignorance. I’m especially concerned that unless our two countries make the effort to get to know one another, we may well be headed on a tragic collision course. Our delegation, made up of Jews, Muslims and Christians will engage in civilian diplomacy and interfaith dialogue to help lay the groundwork for common understanding and create constituencies for peace in both of our countries. This is FOR’s eighth Iran delegation, and we’ll be building upon the significant relationships that have already been created and deepened over the years. We’ll be traveling to Tehran, Shiraz, Qom and Esfahan – I’m particularly excited that we’ll be spending significant time with the Jewish community of Iran. 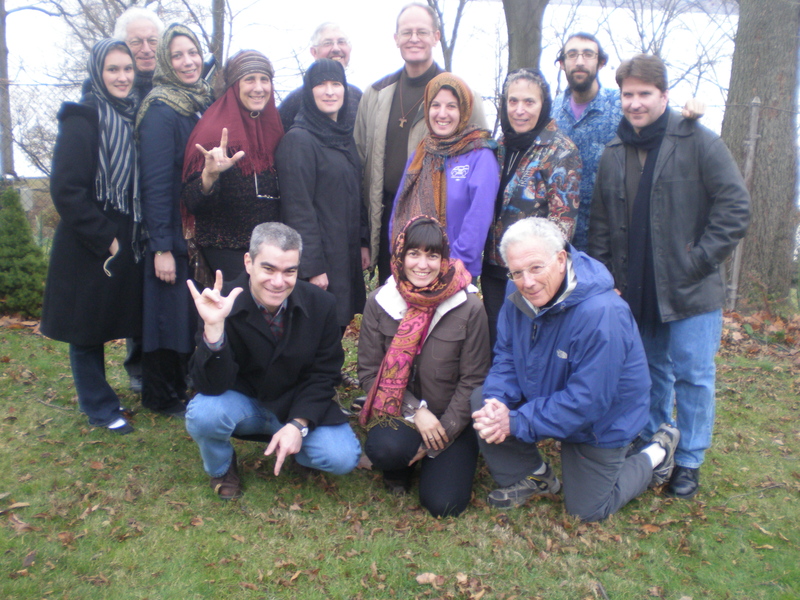 This entry was posted in Interfaith, Iran, Iran Trip 2008, Peace, Religion on November 25, 2008 by Rabbi Brant Rosen.